Now that the weather has broken a bit, I thought I'd recreate a fall card that I made ages ago, and share it with you. The last few years we have had some wonderful autumns, but they always seem so short. While my house still says "Halloween", I'm starting to think about how I want it to be for the winter season, I typically do blues and silvers about this time of year, then at the beginning of December the tree goes up and gets decorated. To begin, I used the "Stitched Leaves" dies from Lawn Fawn to cut the three large leaves from 110lb cardstock. I used Distress inks to make them look like autumn leaves. I used a torn paper die to create my panel from the same cardstock and stamped the greeting using Lawn Fawn Black Licorice ink. I adhered the leaves together using liquid glue, just to give myself a bit of time to have them arranged perfectly. I added a length of natural twine around the front panel, then popped the panel up on foam tape and adhered it to the front of a standard A2 sized card base, in brown. Thank you all so much for you votes and Support! That is such a nice card, and I love the process of using inks for the leaves! Thank you for the inspiration! Trina, those leaves are so realistic...and so pretty! Saw this pretty card over at Muse and had to say how much I love it! I love the way you've inked up those leaves, and that torn paper die looks fantastic, not seen it before. This is gorgeous! The dimension you've got on the leaves looks amazing! Such intense, rich, autumn colours! This is stunning! 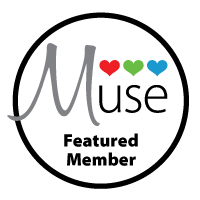 Thanks for joining us at Muse this week, Trina! Gorgeous inking on your leaves and I love the torn edge die!